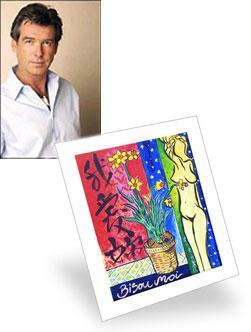 If you're a Pierce Brosnan fan, here's your opportunity to get a limited edition print of Pierce's painting "Bisou Moi (Kiss Me)" and support a worthy cause at the same time. This item is up for auction at CharityFolks.com. The auction is scheduled to close November 15, 2006. Go to the Charity Folks Website and check it out. For more on Pierce's art check out his website.